I had planned to activate two summits on Monday, 9th September, 2013. The first was Mount Lonarch, VK3/ VS-013 which is 788 metres above sea level and is worth 4 SOTA points. It is located in the Mt Cole State Forest (for more info, please see the blog re Ben Nevis). Mount Lonarch is very easy to access, as there is a road straight to the top. I travelled out of Ararat, heading east along the Western Highway. As I did I drove passed both Mount Buangor and Mount Langi Ghiran. Mount Buangor was my afternoon climb, and Mt Lang Ghiran was my first climb tomorrow morning. I stopped off for a quick look at a few sights near the little town of Buangor. 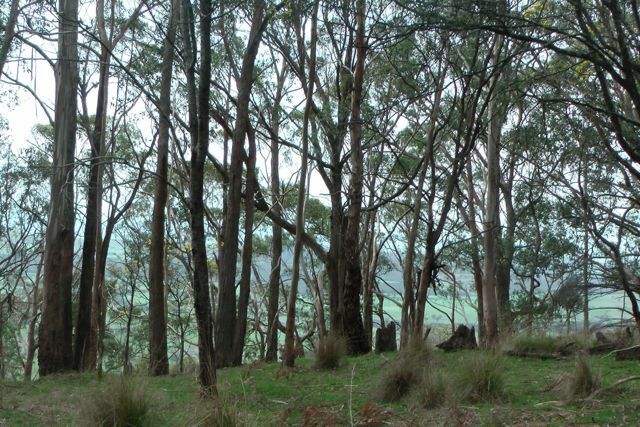 Located on the bank of Billy Billy Creek, Buangor is nestled between Mount Buangor, Mount Cole and Mount Langi Ghiran. 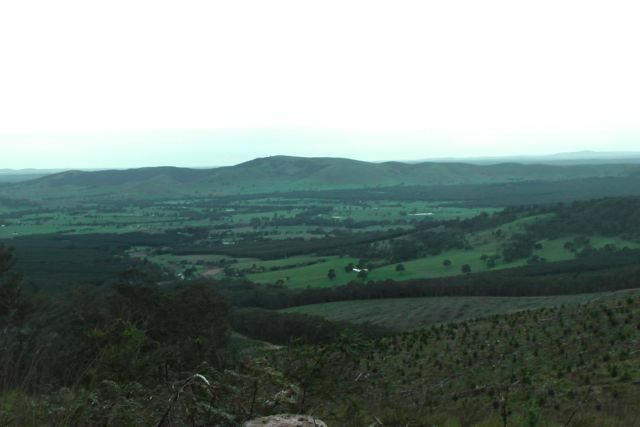 The area is the location of the Challicum Hills Wind Farm, Australia’s largest windfarm at time of completion in August 2003. 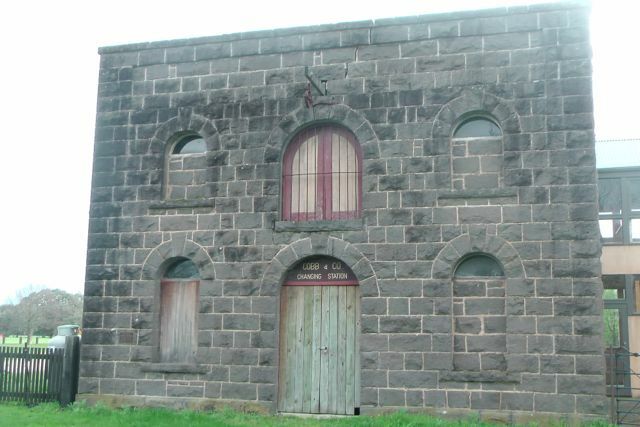 The focal point in the township of Buangor is the heritage-listed Cobb & Co building formerly used as staging stables. I turned left off the Highway onto Eurambeen-Raglan Road, and into the little township of Raglan, which was named after FitzRoy Somerset, 1st Baron Reaglan, who was a Field Marshal during the Crimean War. Many of the residents of Raglan are descendants of the first European settlers of the area, with various roads and lanes bearing the family names of those settlers. The main industry of Raglan is sheep grazing with sundry support business such as live stock transport also exist in the town. 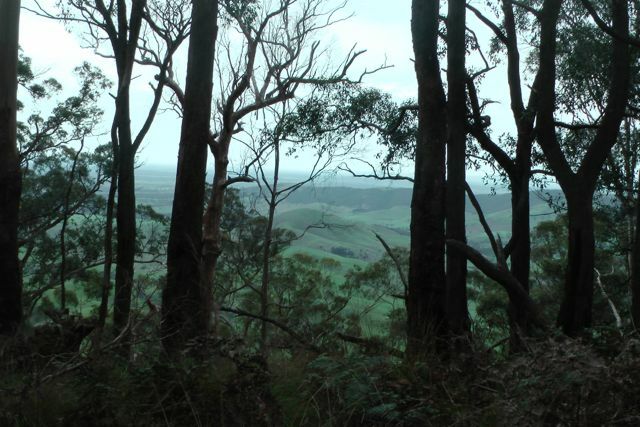 After travelling through Raglan, I continued north on the Raglan-Elmhurst Road, and then turned right onto the Mount Lonarch Road, and up through the Mount Lonarch Forest. 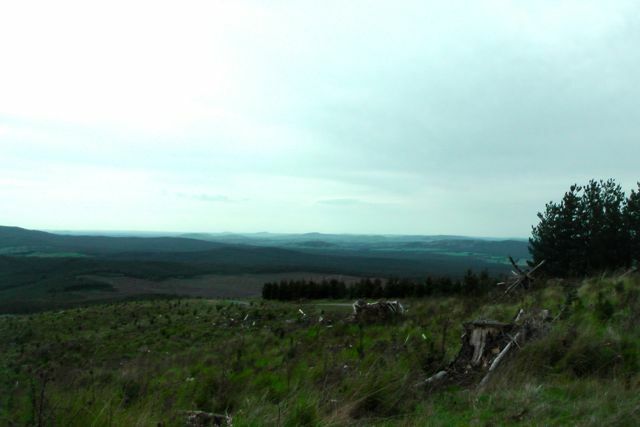 I then turned left onto Tower Road and headed north to the summit. To your east at this point there are magnificent views out towards Ben Major, VK3/ VS-028 and Ben More, VK3/ VS-027, the surrounding valley and the town of Lexton. After travelling about 3 km along Tower Road, I encountered trouble ! There in front of me completely blocking the dirt road was a tip truck and trailer, and no one at all in sight. I still had at least 4 km to go to the summit. 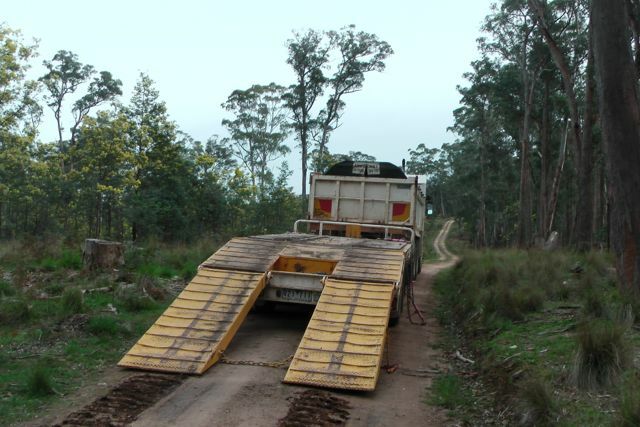 Fortunately I was able to navigate the Ford Falcon around the truck and back onto the dirt road. As I drove further down the road I saw a guy working on a Bobcat and apparently cutting some fire breaks in the scrub and the forest. I continued on up Tower Road and parked about 1 km from the actual summit, and walked the remainder of the way. On the way up I bumped into a worker who apologised for the road being blocked. He and another guy were up on the summit clearing fire breaks. Once you reach the summit, there is a little bit of disapointment, as the view is obscured by all the trees. 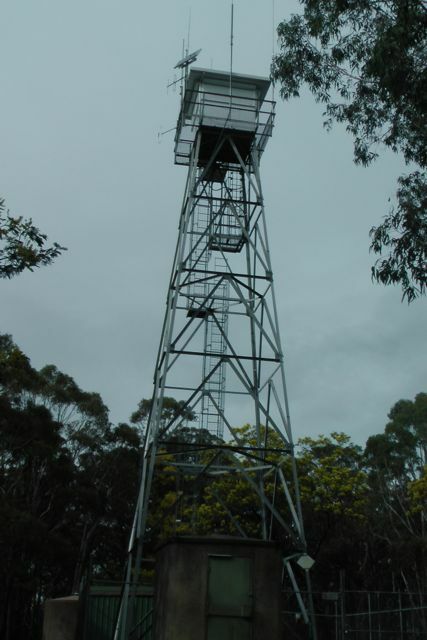 There is a fire spotting tower at the summit and I would imagine that the view from there above the tree canopy would be extra special. I found a stump of a dead sapling and this looked like the perfect thing to strap my 7m squid pole to, which is exactly what I did. 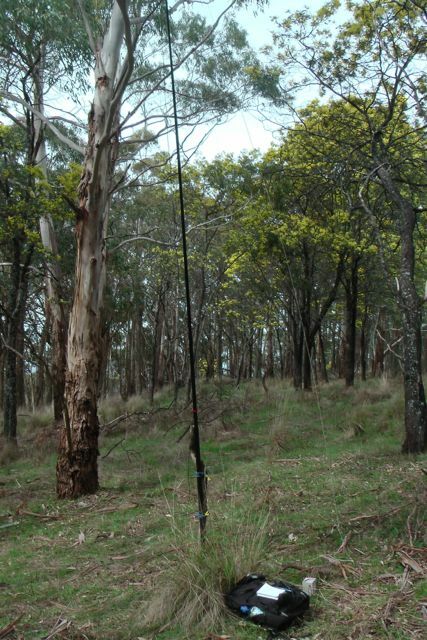 I then stretched out the legs of the dipole and tied them off to nearby trees. There are no shortage of options up here when it comes to trees. I only had about 8 minutes before the UTC rollover, so I immediately went to 7.090 and put a call out, and was greeted by all the regular SOTA chasers. The 4 qualifying contacts being with Tony VK3CAT who was mobile, Peter Vk3FPSR, Bernard VK3AMB, and Peter VK3PF who was operating QRP. I managed 9 QSO’s before the UTC rollover. After the new day I worked a further 23 stations on 40m SSB. I worked quite a few QRP stations which was good to see as always. They included Peter VK3PF, Andrew VK3ARR, Andrew VK2ONZ, Warren VK3BYD who was portable near Violet Town, and George VK4GSF who was using just 12 watts. It was great to get a QRP to QRP contact all the way to Queensland. I was also lucky enough to work John VK5BJE who was portable in the Wyperfield National Park in Victoria, as part of the Keith Roget Memorial National Parks Award. 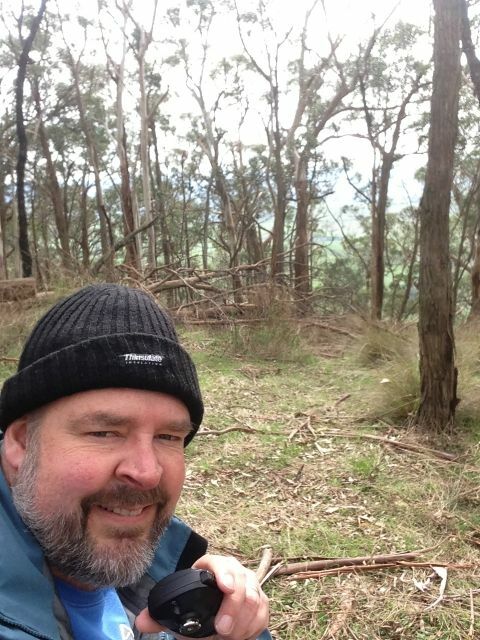 After an hour on the summit, I had 32 contacts in the log and it was time to head off to Mount Buangor, which I knew was going to be much more challenging to get to the top that here at Mount Lonarch. Tony VK3CAT/m; Peter VK3FPSR; Bernard VK3AMB; Peter VK3PF/qrp; Andrew VK3ARR/qrp; Larry VK5LY; Brian VK3MCD; Andrew VK2ONZ/qrp; & Brian VK5FMID. Ron VK3AFW; Larry VK5LY; Tony VK3CAT/m; Peter VK3FPSR; Warren VK3BYD/p; Bernard VK3AMB; Andrew VK3ARR/qrp; Peter VK3PF; Fred Vk3JM; Brian VK3MCD; Ron VK3JP; Terry VK5ATN; Brian VK5FMID; John VK5BJE/p; Andrew VK2ONZ/qrp; Vin VK3FMOL; Bill VK5MBD; John VK5FMJC; George VK4GSF; Dale VK5FSCK; Tony VK5ZAI; Ivan VK5HS; and Colin VK3UBY.